The course EdTech 597 is my first course in the Boise State EdTech program. It is also the first fully online credit course I have taken. In 1990, I completed my Masters of Arts in a traditional classroom delivery model. In 1995, I started teaching in a post-graduate College program at Conestoga College. 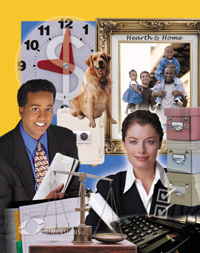 In 1997, I created my first online course. Five years ago, the program became 100% online. The most important learning experience for me this term was that of being a student again. Through this experience, I have been truly humbled and am deeply appreciative of this learning opportunity. One of the things I have observed with my own students is that there is a need to “learn the technology and systems in order to use the technology and systems to learn”. In other words, the process of becoming literate in the course is critical to be able to learn from the course. A significant amount of my time has been spent learning how the technology and systems worked. It is this understanding that has impacted my the most. I am now determined to set-up a mandatory non-credit ‘orientation’ course for the program I teach in. I am also going to ensure that I am very clear with all learners in the course design and expectations. Another interesting element for me was the awareness of my own learning preferences. I have always been an independent self-directed learner. I seek out learning opportunities on an ongoing basis in order to accomplish things that I need to do. This means that my learning has been oriented towards very practical ‘just-in-time’ projects. A key difference in a formal course is the need to learn things to earn marks, which may or may not be helpful to my educational practice. The other challenge in this formal approach is that I found it difficult to come up with learning designs that I was not likely to put into practice in my courses. In the past, when I am designing a course, I take a lot more time than the length of a summer course allows. However, I do see that I will be able to integrate this material into future course designs. In regards to the AECT standards, the course assignment projects facilitated the development of the “Design, Development and Utilization” competencies. I created learning outcomes and designed instructional strategies to meet those goals by integrating a variety of audio, visual and text-based social media. One of my favourite assignments was the review of sound based activities, which helped me to develop my evaluative capabilities in the audio domain of learning. I make no claim to have mastered these standards through the course assignments; however, I have become empassioned to continue to professional development to achieve this over time! To understand what I mean by this and its relevance for my teaching, I invite you to listen to this quote to understand My Passion for Teaching. The Bruce Trail is Canada’s oldest and longest footpath and provides the only continuous public access to the Niagara Escarpment, a UNESCO World Biosphere Reserve. It runs along the Niagara Escarpment from Niagara to Tobermory, spanning more than 885 km of main trail and 400 km of side trails. 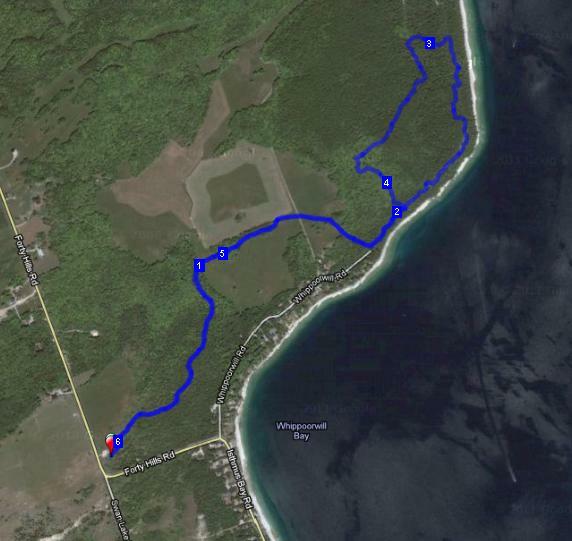 Due to the length of the trail, 9 Bruce Trail Clubs manage it; I am a volunteer with the Peninsula Bruce Trail Club, which covers the trail section from Wiarton to Tobermory. 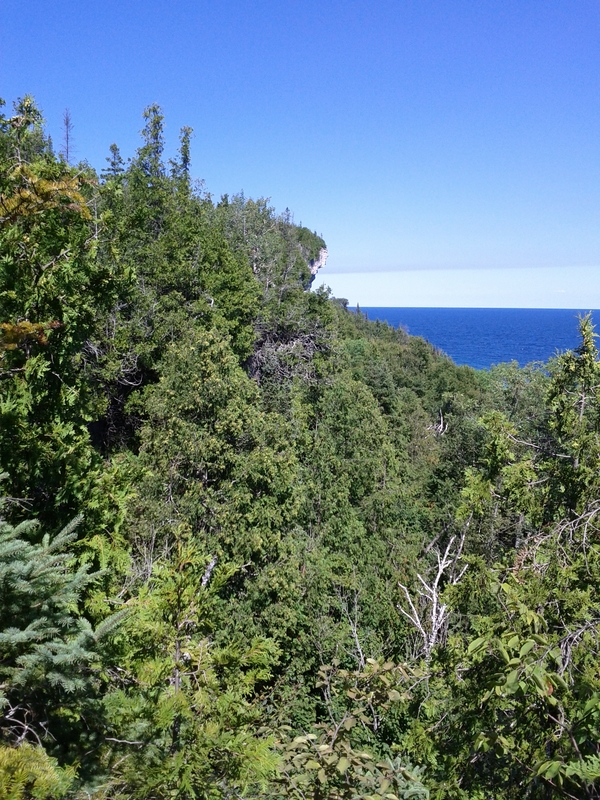 The White Bluff Trail is a section of the Bruce Trail overlooking Isthmus Bay north of Lion’s Head, Ontario. I am the Trail Captain for this section and responsible for maintaining the trail. This trail section is very popular and there are people who hike it who have no experience or awareness of the natural environment that awaits them on this trail. A key goal in this project is to provide information for children and families to help them learn about this natural environment. In particular, this project is designed to help them learn about the types of environments (forests, meadows, cliffs and streams) and the birds that live in them. 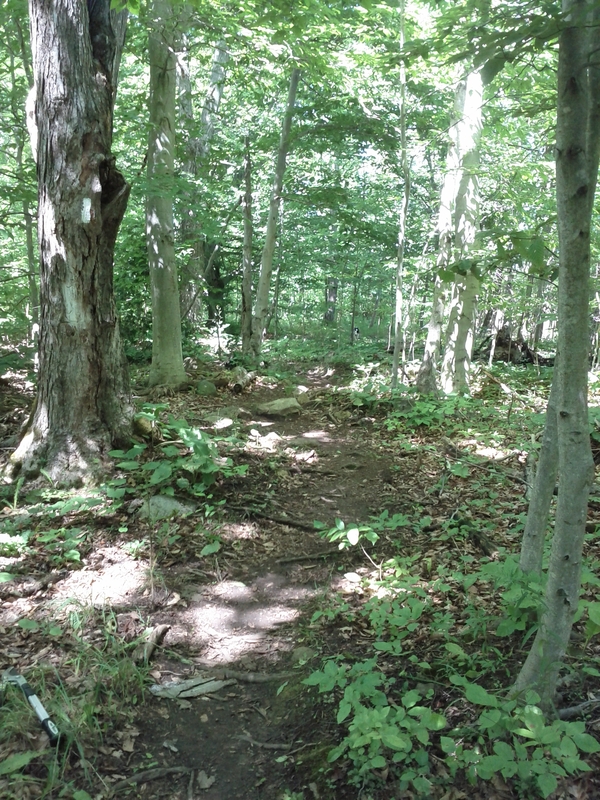 This project is intended to be used as a preparatory piece prior to a school group or family heading out on the trail. The map shows where the different types of environments are on the trail and the sound links (all developed by the Cornell Lab of Ornithology) provide background information and recordings for each of the bird species. Additionally, a Trail Hike Log is provided to help them record their experiences. This trail hike is 6 km in total and requires 2-3 hours of time to complete. When hiking into the main trail you will pass through open fields (Km 1.0-1.75). These meadows are filled with many species year-round. An important bird to listen for is the Bobolink. A grassland bird, it nests in cultivated meadows. 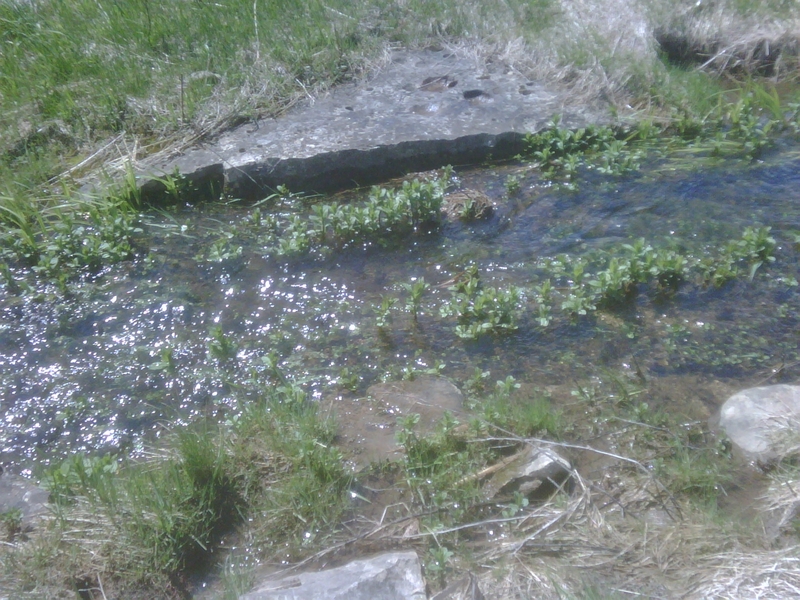 There is a stream running through the middle of the meadow (Km 1.2 on the entry and Km 5 on the return trip). This rich ecosystem supports many species, including the Belted Kingfisher. The White Bluff is aptly names due to the cliffs of dolostone. You will witness these at lookouts from Kilometres 1.8 to 2.8. Despite the extreme temperature fluctuations, high winds, and low nutrient levels, life clings to these rocky edges. Turkey vultures soar on the thermals create by the cliff wall. Cliff swallows nest in the cracks of the cliff face. Download your trail hike log here. Enjoy listening for these birds while you hike on the White Bluff Trail! One of the elements of my work in career development involves understanding personalities and their relationship to career fulfilment. Many of the different systems used divide the human personalities into four basic temperaments. An example of this approach is the Canadian model Personality Dimensions. 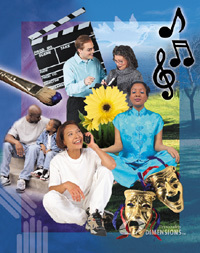 As a fun exercise, I have provided an image for each of the four personalities (Source: www.personalitydimensions.ca), a brief text and a corresponding type of music that I believe is representative of the temperament. Greens are constantly trying to figure out the world and why it is the way it is. Knowledge means power to them. If they know how something works they can control it. They are constantly striving to better themselves, so they are their own main competitor. They may be satisfied with what they have done today, but tomorrow they will have to do even better. They want logical answers to everything. They do not access their feelings easily. They much prefer to deal with the world in a logical rather than a values-based way. Gold individuals have the temperament with the highest percentage in the total population— nearly half. They are the ones who act as the steadying element in our society. Today, our society is in an ever-accelerating state of change. Without the Gold’s stabilizing effect, can you imagine the chaos our lives would be in? Golds tend to use words that are more concrete rather than abstract ones. At social gatherings, they tend to talk about their everyday lives, the happenings at work and about their families rather than new and different ideas. Of the four temperaments, the Orange temperament is probably the one that stands out the most. These include actors, sports players, singers, crafts people, as well as the trades people, builders, repair workers, and sales people. Their world is tools. The tool they use might even be their body in the case of a boxer or a singer. They have an instinctive knowledge of how to use a tool to its best advantage. They use tools in very practical ways. If a tool will get the job done, they will use it even if that was not its original purpose. The people having a Blue temperament tend to be future oriented. They are interested in new ideas particularly ones that relate to people. They are eternally optimistic that the world is going to get better and that everyone will live in peace and harmony. While they are concerned about everyday things like seeing that everyone is fed, they are more concerned about seeing that everyone has the opportunity to develop their full potential. Unfortunately there have been all too frequent occasions in the past few months where I have experienced this (e.g. lawn mowers, loud cars, trucks and motorcycles, chainsaws, etc.). Upon reflection of all the different sodcasts I have received over the summer, I have decided that the worst one (in my experience) is that of a ‘SeaDoo’. When I am swimming in a large lake and enjoying the natural environment, there is nothing so irritating as the high pitched whining sound of an approaching ‘SeaDoo’. I think the reason that it is more irritating is the fact that sound travels so well in water that the vibration affects my ears and my body. 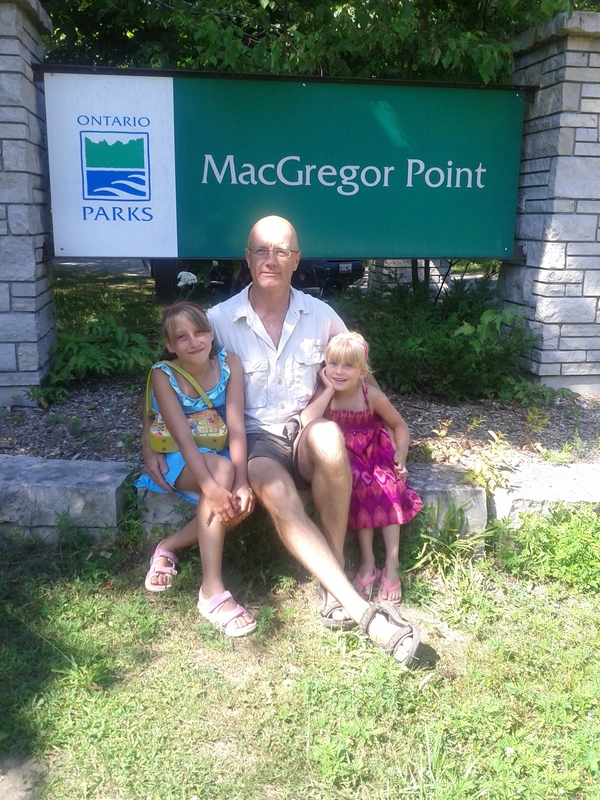 This summer I our family went on a camping trip to MacGregor Point Provincial Park. 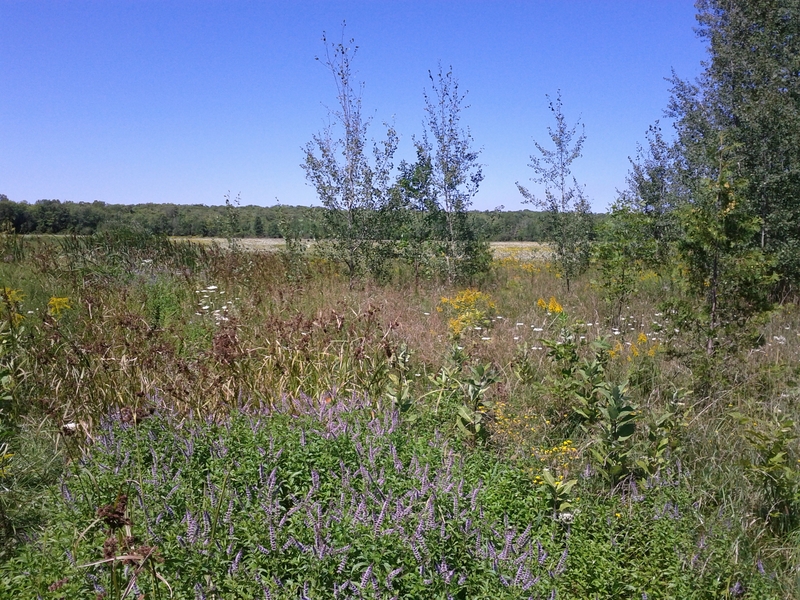 It is a beautiful landscape on the west shores of Lake Huron just south of Port Elgin, Ontario. 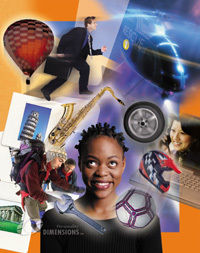 The intention of the design was to provide a ‘virtual guide’ for park visitors. I have often visited places and wanted to get more information from others who had been there before. This approach provided an opportunity to experiment with the idea. The Woices site presented a few learning curves. Although there is an app for the system, it is only for listening to finished material, you cannot use it to create material. This is unfortunate as it would be really interesting to create material on-site. The file upload feature is also slow, I load material to my WordPress blog in a 1/10th of the time it takes to load files into Woices. The goal of this series of activities is to explore the integration of sounds in learning spheres with reference to the research of Richard Mayer and Roxanne Moreno. The key element in this process is to pay attention to how text, images, video and audio work together (or not) to enhance (or distract) the learning process. The list below starts with my worst experience and ends with the best. One of the challenges I found when going to choose listening activities is that I would go into websites that had activities, however, in a number of cases, there was a lot of text on the page and the activities were not a focus of the web page. The visual clutter of text caused me to simply close the page and move on. I forced myself to stay on this page and at least listen to a few of the interviews. The recordings were poor quality and the noise was distracting. This experience coupled with the poor page design created what I call the “fuzzy cognition” experience. The only solution is to close the page and walk away from the computer for a few minutes to let my brain settle down. A key issue in the design of an experience is to ensure that the design teaches what it is intended to teach. While the idea of the ‘matching’ the pairs is cute, I am not convinced that any learning takes place in this design. The focus of the game (at least for me) became successful completion and the learning became secondary. I also found that the quality of the animal sounds was poor and became an irritant as time passed. I enjoy wildlife tracking so I thought it would be interesting to watch this video (3 minutes) of an interview with a nature listener / tracker. The challenge in this delivery is that there was actually too much going on in the movie for me to learn from the environment. The interviewee’s voice drowned out the natural sounds. I kept looking at the images, then trying to hear the background, which was interrupted by the person’s voice. Although this video was appropriate as an introduction to what a tracker does, it was also frustrating. I love nature and the availability of learning experiences in this venue intrigued me. The first activity was an opportunity to learn about birds and their different voices (calls, alarms and songs). This activity was well designed, it provided a short text introduction, a set of 3 audio sounds to discern for each bird, a drag and drop activity followed with immediate feedback. The separation of visual/test and the sounds made it easy to learn and follow. The creation of an integrated set of videos of a saxophonist in different locations was brilliant! The key element that affected me was the ease and joy of learning throughout this vignette. When I came to the page, I started reading, and then the first image appeared for the video, followed by the sound of the saxophone. It was easy (and pleasant) for me to move back and forth between the text and video while listening to the sound. I also found it easy to take notes of the different physical spaces the musician was in. I was profoundly impacted by the power and simplicity of this learning design! This learning activity was elegantly ‘layered’. It opened with text, then the first images of the video, followed by the sound of an oboe. I was able to read the text on the side and listen to the sounds, while moving back and forth between the text and the changing images. The music paused and there was a very short interview, making one point, I was able to focus on this completely, then it moved back to the instruments and sound. This returned to another brief interview and back. There were also a few key words displayed on the screen, which reinforced the interviews. I was able to follow the flow and never felt any sense of overload. In fact, I believe it was designed very well as I was able to follow the presentation while becoming increasingly interested due to the combined affect of the content and the joy of listening to the music! The orchestra tuning activity was the best learning design that I experienced in this process!